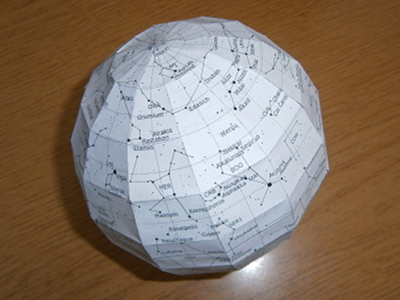 Suopte StellaSphaera is an application with which you can create a do-it-yourself (DIY) paper maquette of the night sky. The scale model fabricated from the generated PDF is an inside out celestial sphere, it is a skyglobe with several astronomical objects on it visible with naked eyes (88 constellations from the IAU catalogue and up to 4995 stars). Suopte StellaSphaera may be helpful for amateur astronomers who watch the night sky with naked eyes or low performance telescope learning about constellations and stars. It may also be recommended for paper maquette/scale model funs, who would like to enrich their collection with a special piece. Before generating the blueprint of the scale model you can adjust several parameters according to your needs (click Adjust preferences tab below), but if you are not sure, you can also use default settings for a 12 cm StellaSphaera model (click Generate PDF button). Before generating StellaSphaera PDF please confirm that you are not a robot, but a human person by solving the image recognition test below. The source code of this project is proprietary. The generated PDF documents can be used absolutely free of charge for non commercial purposes. Redistribution of the generated PDF files in any form (e.g.on other websites, printed sheets) is not allowed. All rights reserved. send photos of your own maquettes. Photos would be used to create a user contributed gallery of StellaSphaera maquettes to demonstrate various settings and color schemes. Your opinion or contribution would be highly appreciated.